A series of titanium oxide catalysts modified with yttrium has been prepared by sol–gel method and their structural properties have been studied. The incorporation of yttrium in the titania lattice favors the formation of oxygen vacancies while at low Y loadings the anatase structure is preserved. The catalytic activity of these solids for CO oxidation is found to be significantly dependent on their physical properties. In particular the amount of dopant controls the number of surface oxygen vacancies created as well as the gold particle size, which directly affects the catalytic activity. 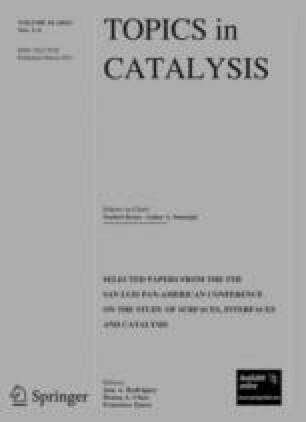 Also, a linear relationship between the catalytic activity and the band gap values, which depend on the Y loading, is observed. Density functional theory based calculations show that Y atoms are incorporated at the TiO2 surface at substitutional positions only, while the preferred oxygen vacancies arise by removing the bridge surface oxygen atoms. These O-vacancies are the preferential adsorption sites for Au atoms and nanoparticles, acting as nucleation centers that favor the dispersion of the catalyst active phase over the support surface. In agreement with experiment, Y doping is found to decrease the band gap of the support due to a destabilization of the valence band of the oxide. The online version of this article (doi: 10.1007/s11244-011-9639-4) contains supplementary material, which is available to authorized users. This work was funded by the Ministerio de Ciencia e Innovación, Spain, (grants ENE2009-14522-C05-01, MAT2008-04918 and CSD-00023, co-financed by FEDER from European Union), and the Junta de Andalucía (project P08-FQM-03661). Romero-Sarria thanks the Spanish MEC for her contract (Ramón y Cajal Programme). The Red Española de Supercomputación (RES-BSC) provided part of the computer time.